When the Marine Discovery Center cleared the site previously occupied by New Smyrna Beach High School in the summer of 2014, a unique kind of “harvest” took place as the five-acre salt marsh was restored. All of the concrete and structural debris from the high school demolition was removed and salvaged as the Mosquito Lagoon Marine Enhancement Center took shape. In recent weeks, those same materials have been deployed offshore to build artificial reefs for fish and various marine species. “Elements we had to excavate to build the marsh are now truly the home of the barracuda,” said Chad Truxall, executive director at the center, enjoying a reference to both a native marine fish species, as well as the New Smyrna Beach High School mascot. According to Volusia County Coastal Construction Manager Joe Nolin, approximately 90,000 pounds of materials unearthed during construction of the MDC restored saltmarsh area were deployed by barge to the Atlantic Ocean on July 31. A barge loaded with 350-450 tons of clean concrete culverts, structures, jersey barriers and concrete utility poles were hauled offshore to the reef construction area by an ocean-going tugboat. Nolin said the material was methodically deployed onto the seafloor and eight deployments were made this summer in the 1,500-foot by 1,500-foot Flagler nearshore reef construction area. “[The materials were deployed] in a tight pile creating an artificial reef habitat with remarkable spatial complexity that is attractive to a wide range of fish, shrimp, crabs and marine bio-fouling invertebrates that carpet the exposed concrete surfaces,” said Nolin. The nearshore Flagler Avenue reef construction, located approximately 2.5 miles south of Ponce de Leon Inlet and one mile offshore from Flagler Avenue in New Smyrna Beach, created multiple reef placements approximately 70 feet wide by 100 feet long and approximately 10 feet high from the seabed. The site depth is about 40 feet. A second reef was created offshore from Sunglow Pier in Daytona Shores, again using a barge load of 325 tons of clean concrete culverts, concrete structures of varying size and jersey barriers. Those materials were tightly stacked 10 feet high and 90 feet long at a depth of approximately 50 feet. The artificial reefs are the first deployed by Volusia County that are located within one mile of the shoreline, said Truxall. The close proximity to the shoreline is designed to make the reefs more accessible by boat for local anglers, divers, kayakers and paddleboard enthusiasts. “The artificial reef sites have become a focal point for both the diving and fishing communities, as well as a new home for fish and coral,” said Gary Kessler, a Marine Discovery Center boat captain and a Professional Association of Diving Instructors (PADI) Master SCUBA diver trainer. 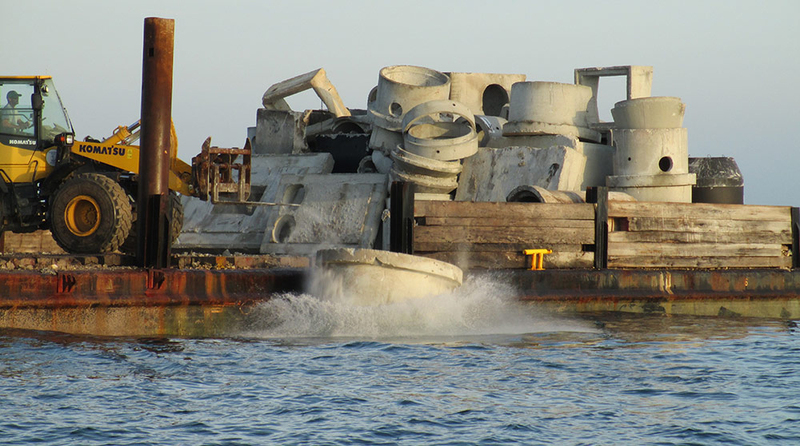 The county’s first four artificial reefs were constructed in 1979. In 2014, a total of 14 barge loads of clean culverts and concrete structures were deposited onto new locations to benefit local fishing and diving. To date, 13 artificial reefs have been constructed in 2015. “We have created a marine habitat that will function for decades forward and these reefs will increase the carrying capacity for reef species in our region,” Nolin added. For an update on the reefs, check out http://www.volusiareefs.org/reefsiteinfo.htm.